Are new distribution methods making traditional navigation redundant? Over the last few years the way content is distributed has been heavily influenced by the widespread adoption of blogging platforms " like WordPress " and perhaps more importantly by the widespread use of social media. This has resulted in content being created that doesn't necessarily sit neatly within a traditional structure, so perhap the times are a changing. Most business websites " especially B2B websites " use traditional navigation systems that organise content into related groups of information. This works when the website copy is created in an organised / logical manner, but starts to break down when information is created in isolation. The traditional work around this issue is to create an abstract collection of individual pages that are presented either as news articles, press releases or blogs. Search engines now focus on fresh, compelling and relevant content so will inevitably drive traffic to these abstract collections of pages that stand alone thus ending up with high bounce rates; people find what they are looking for and then move on and as much of this content is in the form of blogs, the calls to actions can become blurred. This is, in part, because the content doesn't sit naturally within the traditional navigation and / or content so does not naturally lead website visitors into the main website where calls to actions are far clearer. Atag cloudis a visualisation of text based content " often using keyword meta tags " that organises adjectives (tags) into a format that highlights the most popular terms visited by users or the most frequently used. 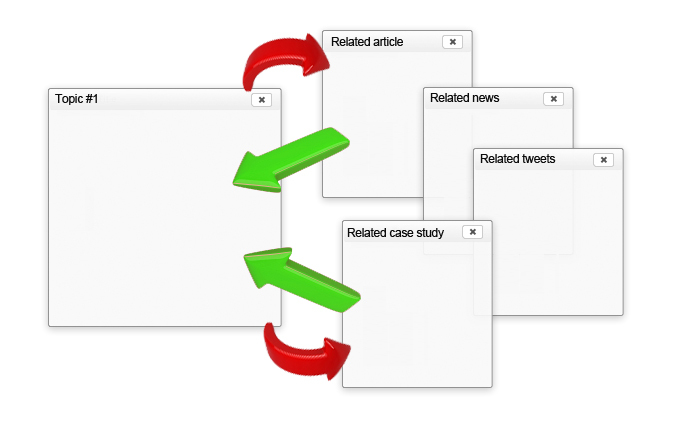 This allows content authors to create relationships between seemingly unrelated snippets of information. Social media sites use a number of variations to this approach, for example Twitter uses hash tags (#ayrmer). In our experience, we find that people find it far easier to write content that has a very narrow focus that does not appear to relate to their main website content. This isn't always the case, but it is becoming increasing common for businesses to talk around their main business in order to promote their expertise in their sector. We published an article about User Acceptance Test (UAT) that attracts a huge volume of traffic and is an intrinsic part of our processes, but is not immediately obvious to the website visitor that it relates to what we do as a business. Other examples include: "
Case studies that might be related to two or three areas within the business. Blog articles and / or tweets that relate to a number of areas within the business. Certainly the explosion in social media and the distribution of marketing collateral via these channels increases the problem of connecting the dots so that website visitors are encouraged to go deeper into your website, with the obvious business objectives. Traditional navigation is still useful for website content that has been written using a logic and systematic approach, but needs to be able to connect the dots together and sometimes this is either extremely difficult or becomes clumsy. Using the principle of tag clouds website authors could create isolated content that is joined together using one or more adjectives to create realistic connections between seemingly disconnected information. By using this approach users could be presented information that would not only be of interest, but would also encourage users to delve deeper into the overall content. We first suggested this idea to a client last summer, as his website visitors were forced down a maze, that if they made one wrong turn, would never get to the end. This is more common than you might at first realise and users are often sent down dead ends, especially with search engine results.